I’ve been working on this piece for several days – it started as one thing and, as so often happens, morphed into another. I am determined to continue in my practise of using colours that are not common to my palette – it’s good for me to stretch my wings… This one started off with red and orange, which should be fine as they are side by side on the colour wheel – but when the green came along that simply didn’t work so I morphed the orange into yellow in an attempt to lift the image. I have developed a decided love/hate relationship with it! And it’s an awful photo – there is so much sparkle and texture that it seems to be impossible for the camera to get its act together. That shadow in the lower left corner is I believe my head. The floor of the conservatory is the best place to take photos – the sun was shining and it was close to midday……… Sigh! Click on the image to get a bigger view, click again for detailed viewing. Mixed media collage on A4 300gsm art paper. Acrylic paint, papers, stamps, paint pen, gel pens, charcoal, pitt pens, gold metallic pen and Inca Gold paint. Heart punch by Sullivans and butterfly punch by Martha Stewart. The original layer is two shades of red and some white acrylic paint. When dry I stamped with three different stamps and applied gesso through a template randomly. A third coat of thinned white paint was applied and wiped away while still wet to grunge it up a bit. The bird was drawn freehand on lunch-wrap paper [deli paper to some of you], painted and then fussy cut and glued down to the substrate using gel medium. I stuck her down too far to the left. The tree branches were also made originally on deli paper and attached to the substrate. The flowers and leaves were all made from 200gsm paper which was painted and then dry embossed and punched out in two sizes using heart punches. When they were assembled and attached to the substrate I went in with pens and pencils and paints and gussied them up some. When everything was in place I used charcoal and pitt pens to define edges and bring it all together. 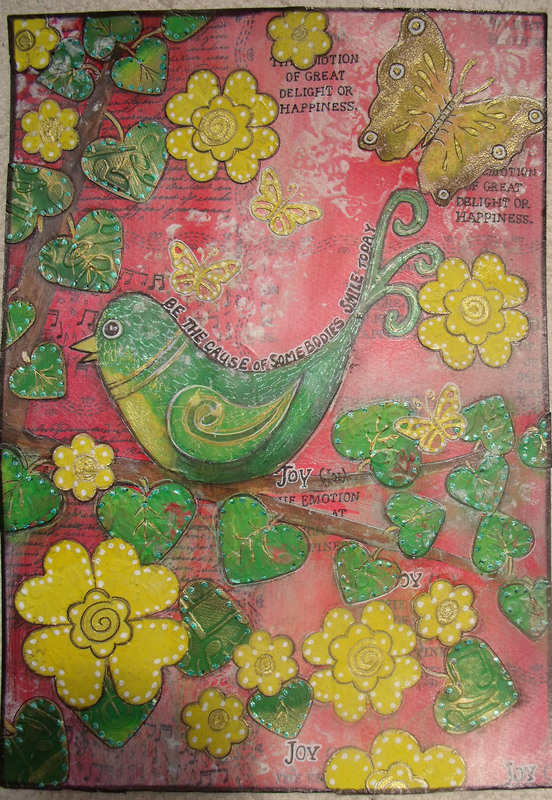 This entry was posted in Creations From My Craft Room, Creativity and tagged 300gsm paper, acrylic paint, art paper, bird, creativity, Martha Stewart, Mixed Media, Paint, Sullivans punches by thecontentedcrafter. Bookmark the permalink. Love it! But it really doesn’t matter if we love it or not… It’s the joy that comes with the creation! Carry on! Thank you Sherry 🙂 I shall indeed! Wow…creativity and joy all over today! I love the greens (my own bias) and especially like the dry embossed texture. I didn’t know you could enlarge and then enlarge again. That is a nifty trick. It allowed me to see all the detail. What patience you have, creating all those layers, then bringing them all together. As for photographing shiny objects, that is quite a challenge. I’ve been wanting to make a mini photo booth for my indoor shots, but I never get around to it. I don’t know where you’ve found the time to create art and an entertainment room and then write about it. Well done, well done! Thank you Alys 🙂 A mini photo booth? I want to know more. Please. Mmmm- pricey, space consuming – perhaps only for the dedicated photographer! However, it has given me a couple of Good Ideas, 🙂 which I will let percolate over the coming week and see if something tangible arises – I’ll let you know! Oh…I can hear the idea machine whirling away from here. Can’t wait to see where you go with this. To me, it looks like you’ve perfectly (perhaps unconsciously) channeled ‘Christmas In Australia’ as I might think of it. The red and green are decided festive but with a lot of sunshine too. I’m afraid I’m a bit of a ‘one-trick pony’ when it comes to colour….I’m such an Aqua girl. I’m amazed at all the detail I can see when I biggie-fy twice….WOW, that must take hours. I like all the layers. You always pick really awesome quotes too. This one fits perfectly across your birdies back, do you know that before pen it in? Oh dear heavens – the Australian cricket colours are green and yellow – I will be drummed out of town! Oh, wonderful tips. Ya ya, find the middle and go from there, thanks for sharing. I didn’t realise you were thinking I was in Oz, I thought you were making reference to their national colours and the heat of summer – I thought you were very clever! Now I realise you are just as addle headed as me! Thank you for that last comment – I must remember that! I must remember that! I mus….. Yes, I’ve had that happen as well – but this one – Well, I’m just not sure that will happen this time….. Right now I’m wondering if I put a coat of melted beeswax over it some magic may occur….. Your Christmas banner is ADORABLE! O is quite the little superstar, posing and proud of himself. O has just stolen his Christmas gift – a large well-grown nepeta plant and destroyed it in 5 seconds flat. O is a very naughty – and rather stoned – boy!! For a good time, call O!